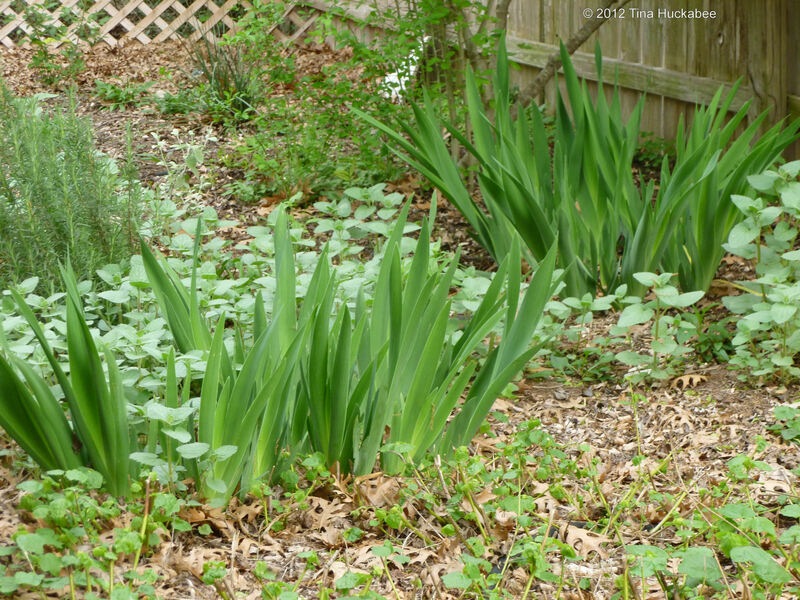 Along with luscious blooms, spring is full of verdant and colorful foliage. And like yesterday’s post on blooms in my garden, it was hard to choose which foliage to profile, but here are my picks. Thanks to Pam at Digging for hosting Foliage Follow-Up. I like to plant Fennel (Foeniculum vulgare) for the Eastern Black Swallowtail butterflies, but I also love the gauzy, elegant quality it lends to the garden. Elegant that is, until the larva eat it down to a sprig. And that “gauzy, elegant” quality is lessened a bit with the Red Oak pollen tassels plopped all over the plant. 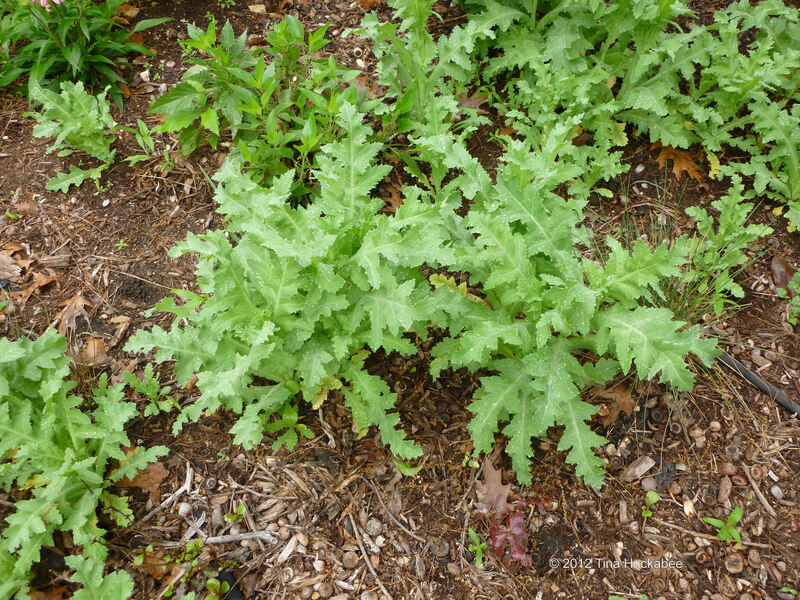 The Red Poppies that I let re-seed in my gardens not only have lovely blooms, but wavy, soft green leaves as well. One of my favorite spring bloomers is the Lyre-leaf Sage (Salvia lyrata). 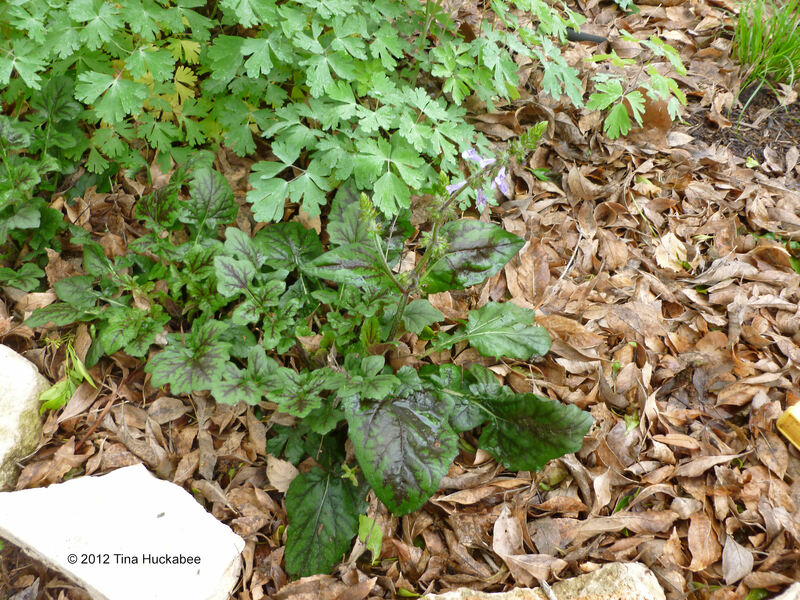 A native Texas ground cover which sends up spikes of blue flowers, it also has interesting foliage and is an excellent ground cover. The scalloped leaves sport a deep burgundy coloring along the veins of the leaves–more prominent in the winter/early spring than at other times of the year, but very attractive year round. 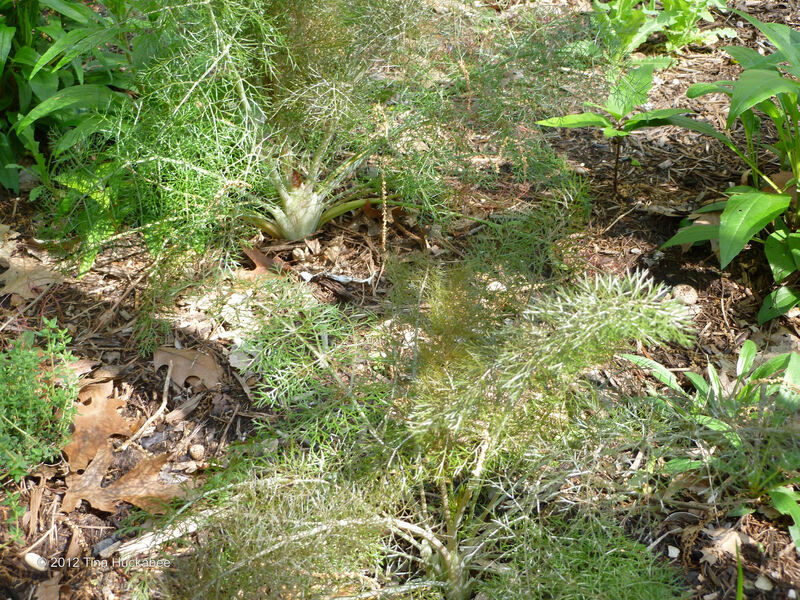 Another favorite is the Mexican Feathergrass (Nassella tenuissima)–it works in so many places, but especially when the sun glints off of its slender, graceful leaves. I love the look of the bright green, vertical Iris straps juxtaposed with the softer, grey-green scalloped leaves of the ground cover, Heartleaf Skullcap (Scutellaria ovata ssp. bracteata). This particular Iris plant was nick-named ‘Shoshana’s Iris’ by Pam, after my daughter, who died suddenly in 2006. I don’t know the “real” name for this Iris, but ‘Shoshana’s Iris’ is what I call it now. Interestingly, both of these plants are pass-a-longs. I gave the Iris bulbs to Pam and she gave me the Skullcap. Nice. I always love how new rose leaves are tinged with purple-to-burgundy leaves. 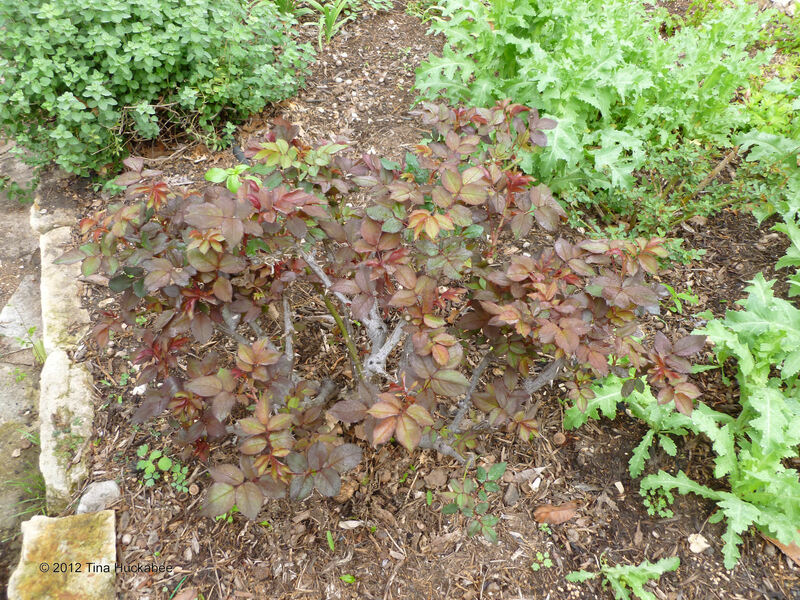 The ‘Knock Out’ Rose has especially beautiful new leaves in the spring, even before its blooms begin. 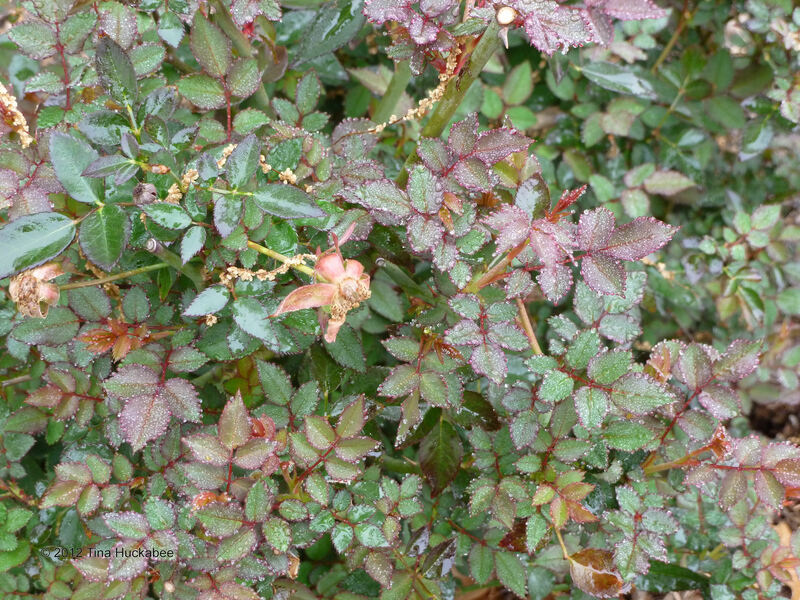 And, the smaller leaves of the ‘Martha Gonzales’ rose blends green with an outline tinge of red. The heavy dew on the leaves (not to mention the Red Oak pollen tassels, again), add a nice touch as well. The fabulous Mt. 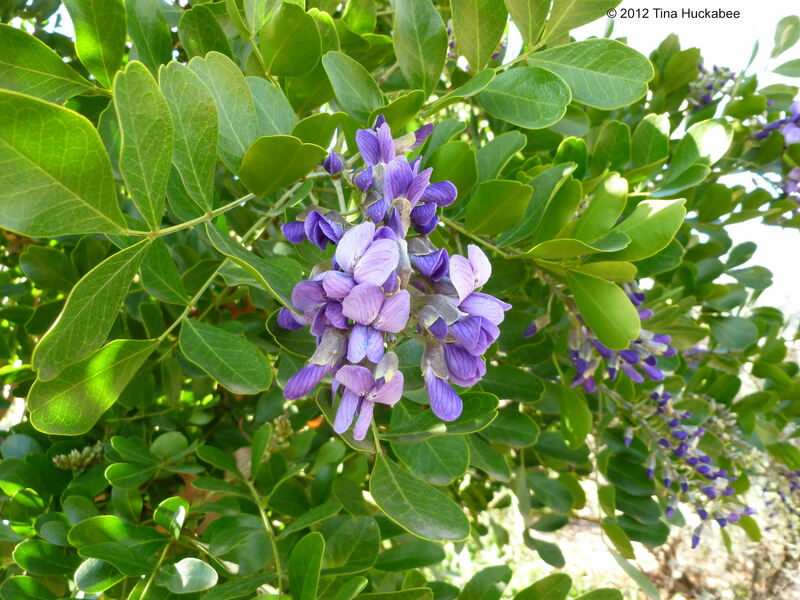 Laurel (Sophora secundiflora) has leaves nearly as fetching as its blooms. 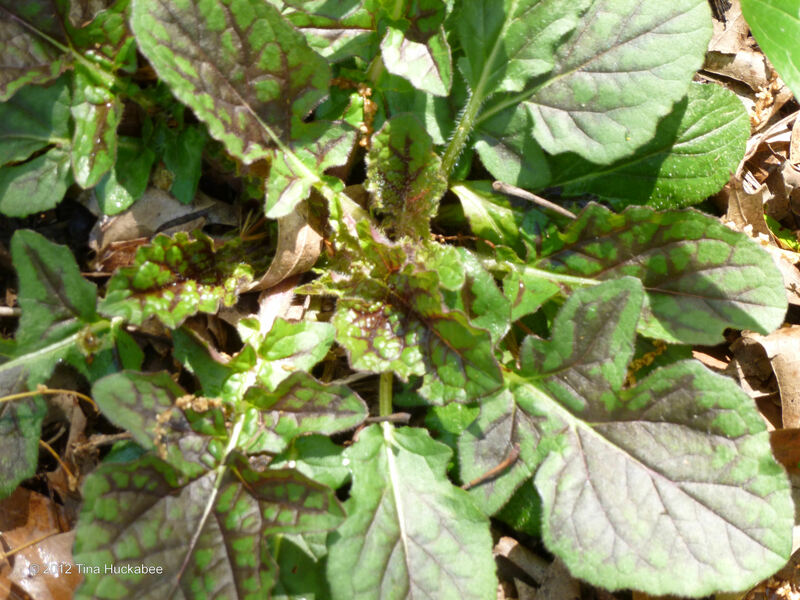 The dark-green, simple leaves are beautiful all year, even after the blooms become seeds for the next generation. to be picked up (and deposited EVERYWHERE) by the Sweeper of the Garden. This entry was posted in Foliage Follow-Up March 2012 by Tina. Bookmark the permalink. Great foliage. And, I love that last photo. We don’t have Red Oak..but the Cedar Elms and Live Oaks give us that same opportunity for a decorated dog. Linda, I know about the mess that both those trees leave. Still, our trees are wonderful and (mostly) I’m glad to have them. I love the trees, but the oak flowers really do get to be a bit much. My neighborhood is full of yellow cars, including mine. Is it just the picture or does your pup have a yellow tint as well? Cute picture! I’m sooooo tired of brushing him! I haven’t had time to rake, so he’s picking up the pollen every time he goes outside. And yes, Ally, the cars are all yellow-tinged. Lovely foliage choices along with a beautiful, touching, and thoughtful story for the naming of the iris. The dog with the velcro fur looks so sweet and so messy at the same time. 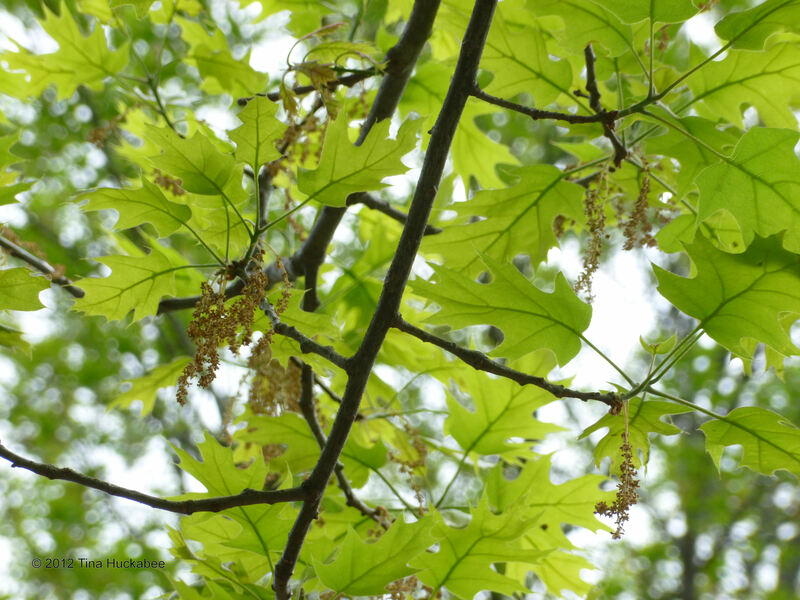 Our oaks aren’t dropping pollen too much yet, but should be soon. Thank you, Shirley. Sometimes the plants we have in our gardens mean more to us than their obvious charms. 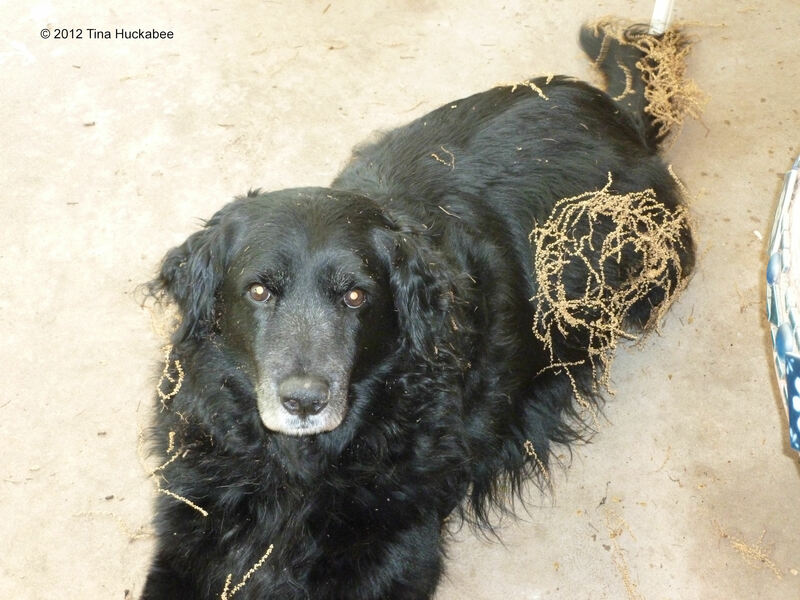 My dog is is sweet and messy–but that’s why we love them, isn’t it? Sorry to hear about your daughter. I think it’s cool the iris is renamed. Happy belated foliage followup. and GBBD. I got some of those skullcap seeds from pan also. Ditto on the feather grass. Have you tried the bronze fennel? Thank you, Greggo. The re-naming is unofficial, but lovely. 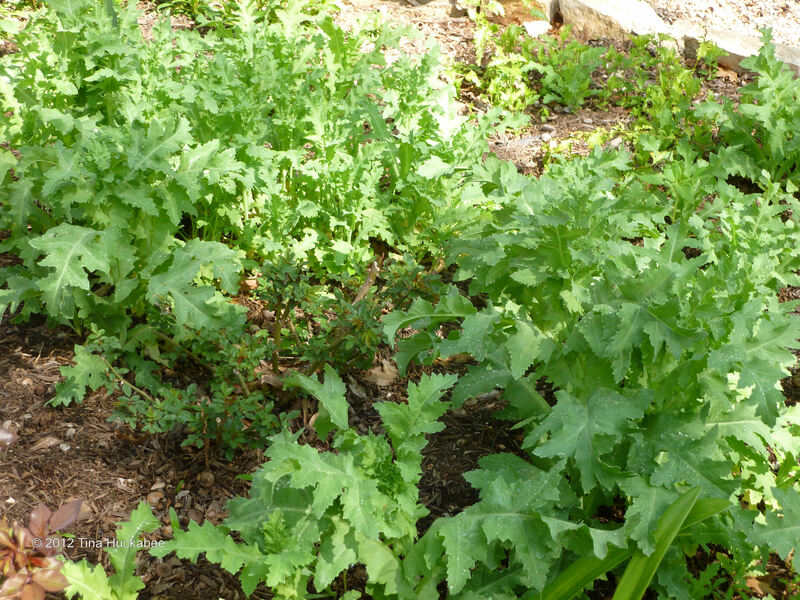 That skullcap is a great plant–in some spots, a little too great. I love it mixed with bright green foliage plants, it’s such a pretty combination. The photos of the fennel don’t really show it well, but those are bronze fennel and they’ve become my favorite to use and the butterflies like them as well as the regular fennel. I started with one fennel, now I have three I need to move.I had only one seed germinate of the skullcap, maybe it will be less aggressive. 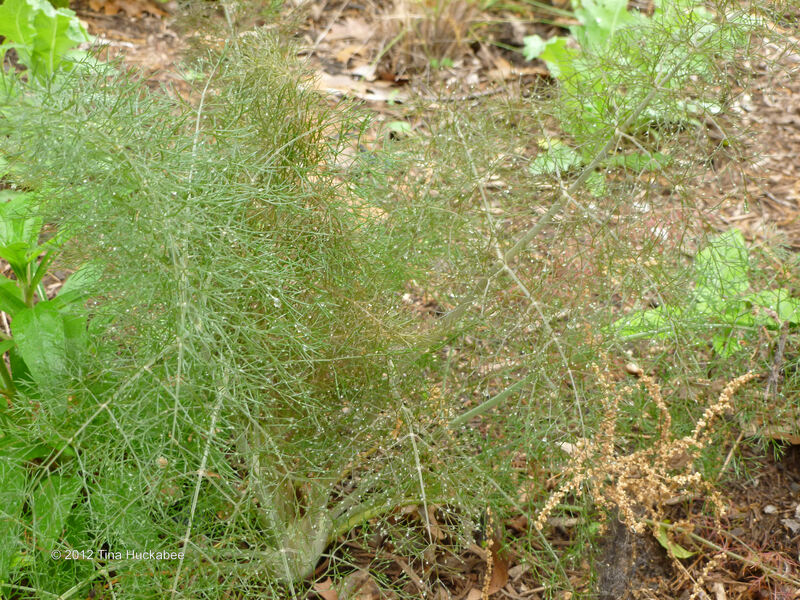 My fennel plants fried last summer–they could not handle our extreme heat. 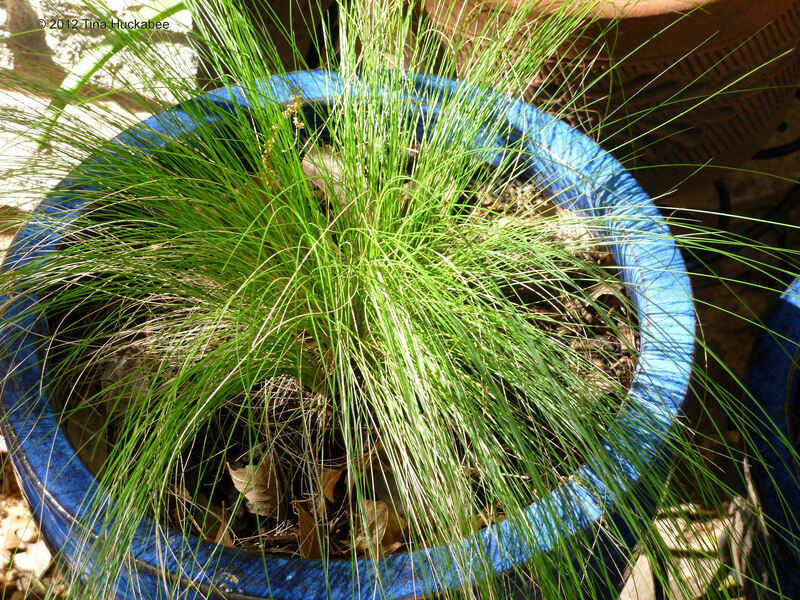 I’ve replaced all the plants that died and they’re ready for eggs and larva–and for me to enjoy. That skullcap is lovely, it just spreads everywhere! So you have fennel! I love the delicate look as well and I bought seeds for bronze fennel this year. Two years ago I bought and planted borage seeds. Every insect in the garden descended upon it. What a battle. I’d like to plant something that attracts butterflies. I’ve never grown borage, but I like its look. You can plant lots of things for nectar sources for butterflies; fennel, parsley, dill, passion vine–there are lots of plants as larval sources too. I agree, that the Garden Sweeper is adorable–and he needs his walk.